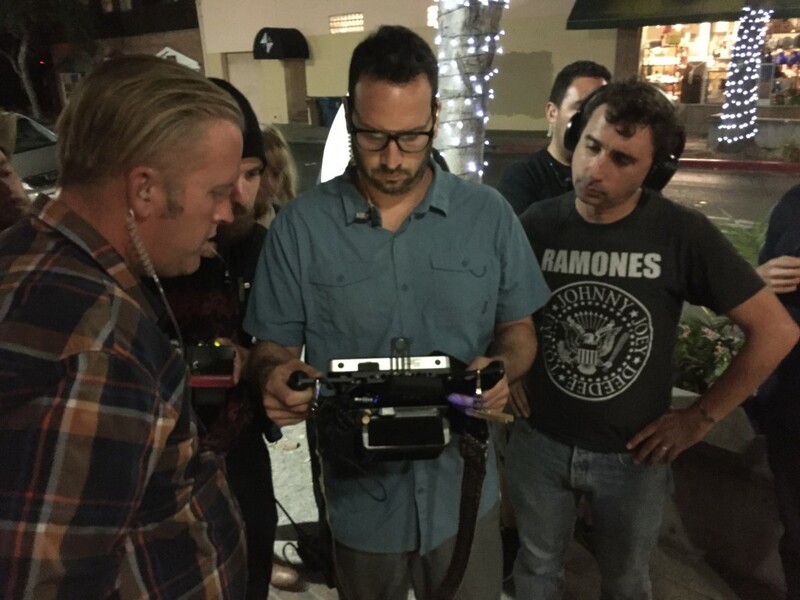 Director Anthony C. Ferrante (right, in Ramones shirt) watches the shooting on a monitor with some of his crew outside the El Campanil Theatre in downtown Antioch, Monday night, August 22, 2016. 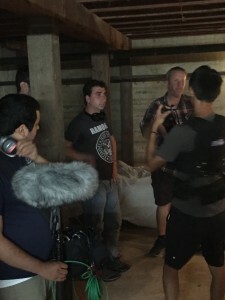 Shooting in one of the rooms in the basement of El Campanil Theatre. While attending Antioch High School, Anthony C. Ferrante took a film course at Los Medanos College. The movie director, who gained fame with his four Sharknado films, has been back in Antioch, over the past two weeks, filming a TV thriller entitled Forgotten Evil. “I filmed a lot of different things in Antioch,” he added. Besides his course at LMC, Ferrante earned his liberal arts degree in film studies from San Francisco State. He also used to be the entertainment critic for Antioch’s former Ledger-Dispatch newspaper, for years. He shared how the idea of returning to his hometown came about. “I forgot how cool downtown was,” he offered. That was earlier this year. Then he was asked to direct his latest film. “I wrote the script four weeks ago, and I kept thinking about Antioch and it was perfect,” he continued. 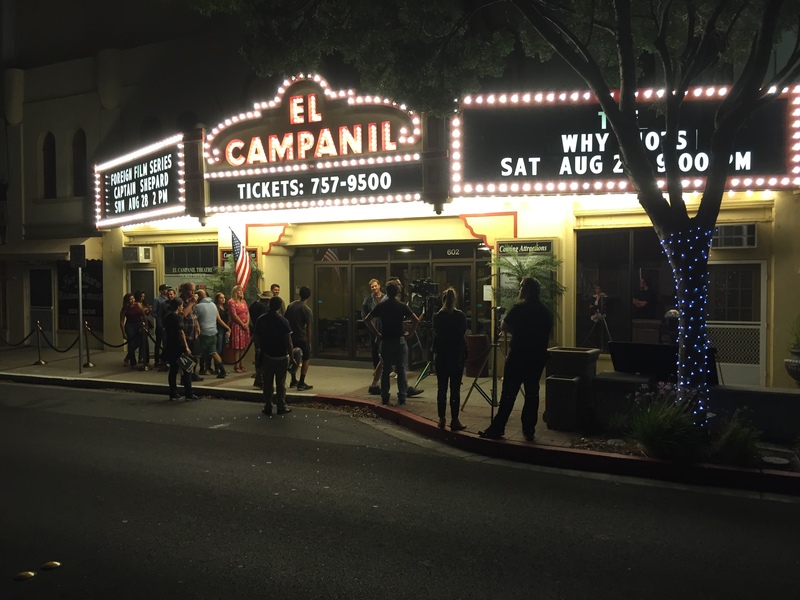 Shooting outside El Campanil Theatre. They also shot at the site of his first film, El Campanil Theatre. “It still has a small town feel and attitude,” he added. Ferrante offered his appreciation and thoughts about Antioch. He was grateful for the support of the Antioch Police, the Chief, the Antioch High School, the principal, Louie Rocha. Family and friends of the crew, as well as other local residents served as extras for the audience scene inside the El Campanil Theatre. 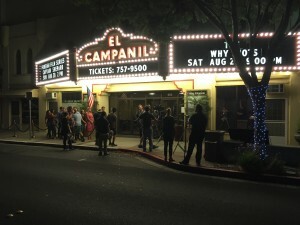 On Monday, August 22nd they filmed inside and outside of the El Campanil Theatre, including in the basement in one of the “creepy rooms” in the front of the building, as described by a member of the film crew. 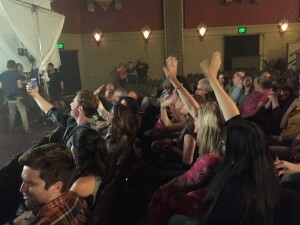 That was also when they needed the most extras, to play members of the audience inside the auditorium. About 100 residents were there. 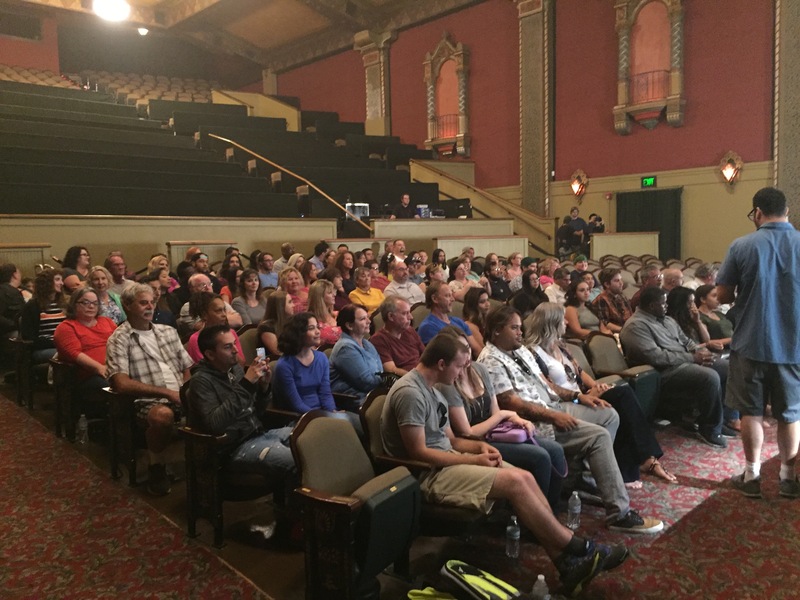 A few were asked to remain for the shooting of the outside scenes. The extras were paid $10 per hour for their participation. They also shot some of the footage at the Antioch Police Facility and the marina, this week. Today and Friday will be their last days of filming, in Antioch. “Then we’re done and start working on editing,” Ferrante said. Extras wave for the selfie photo being taken by the stars of the movie inside the El Campanil Theatre. The main actors of Forgotten Evil include Masiela Lusha, who was also in Sharknado 4, but gained her fame as the daughter of George Lopez in the comedian’s TV series. Ferrante shared more about his movie making. The movie will be sold, once it’s finished. Ferrante isn’t sure yet to which company that will be nor on which channel it will air. But, he hopes to let Antioch residents see it, first. Ferrante is married. They have one daughter and live in Los Angeles. One of his sisters still lives in Antioch and the other lives in Napa. So, expect to see him back in town, not only for the screening, but hopefully more movie making in the future. 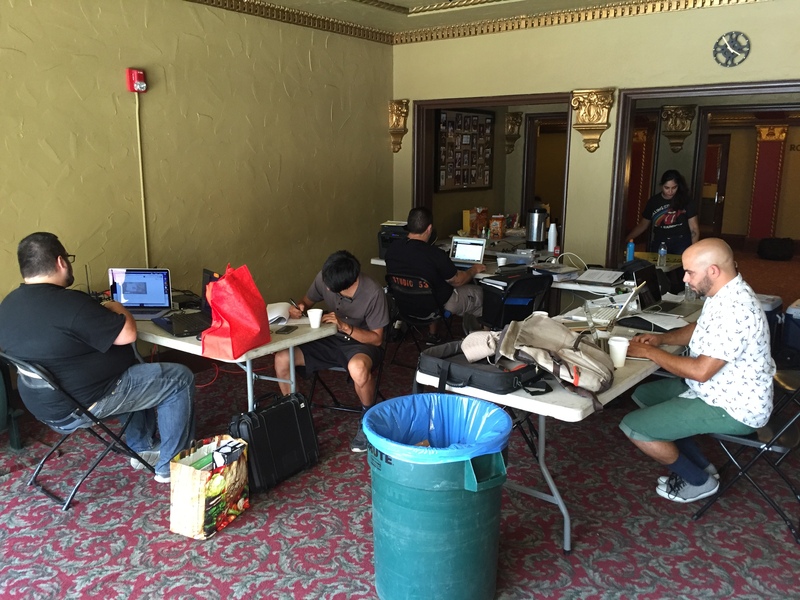 The film crew converted the lobby of the El Campanil Theatre into their local office. This entry was posted on Thursday, September 1st, 2016 at 5:56 am and is filed under News, Arts & Entertainment, People. You can follow any responses to this entry through the RSS 2.0 feed. You can leave a response, or trackback from your own site. Unbelievable, that such a genius who combined sharks and tornados, came from a humble place like Antioch. Sharknado deserves multiple best picture awards. Move over Scorcese, real talent is here. I am VERY interested how do I go forward with this opportunity? Send an email message to the address listed at the bottom of the article.